Riptiders webcomic - Nice fish finish last. Meet the winners. First Race Completed/FanFrenzy 2015 and Backstage update! 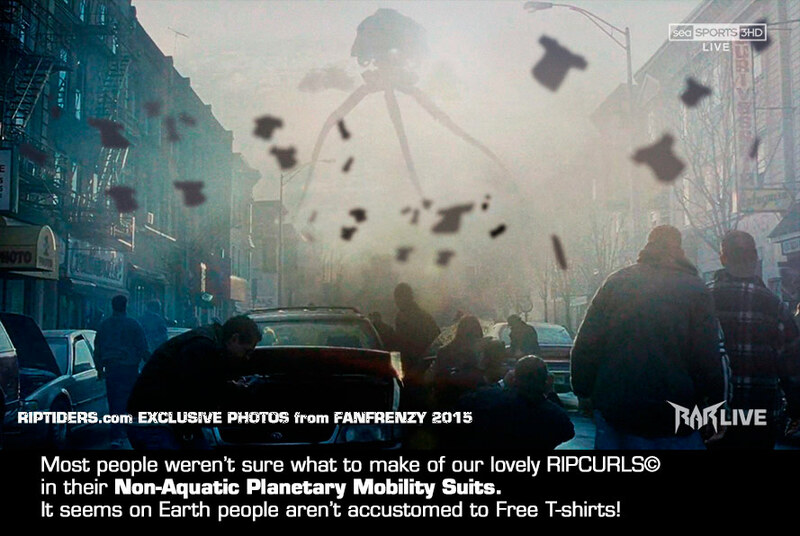 In celebration of the completion of the first Earth broadcast, there was a "surprise invasion" of your planet with FanFrenzy 2015! 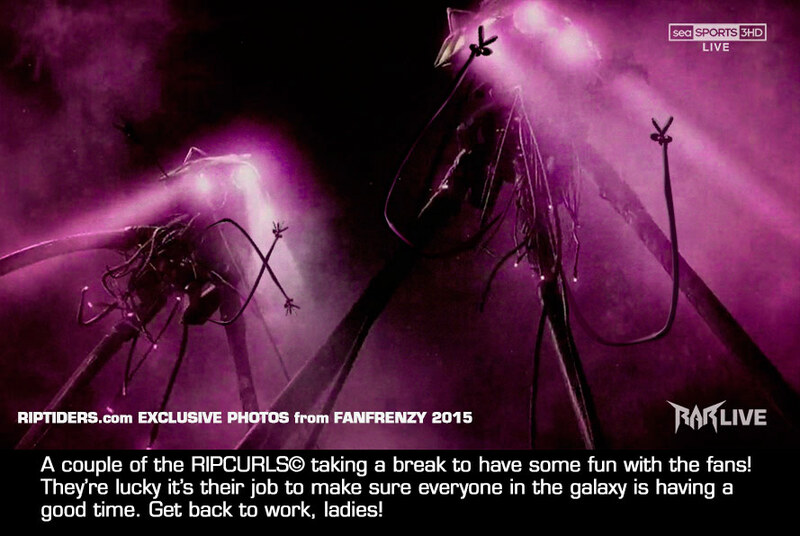 At these events, our RIPCURLS are on hand to distribute free t-shirts and engage with the many fans of the host planet in a fun-filled day of games, music, food, and excitement. 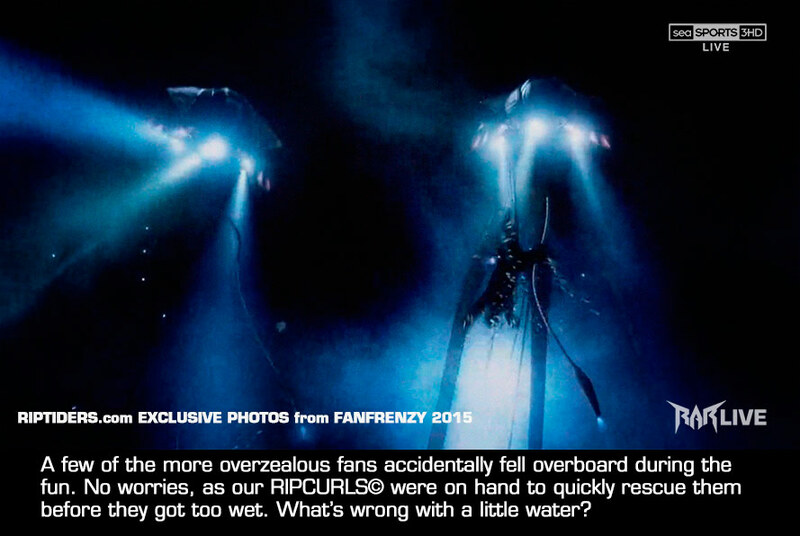 Due however to the geological limitations of the planet Earth, and most of your cities being hosted in non-aquatic surfaces, our Ripcurls were biologically unable to interact directly with the fans. However, RIPTIDERS© always finds a way to have fun! 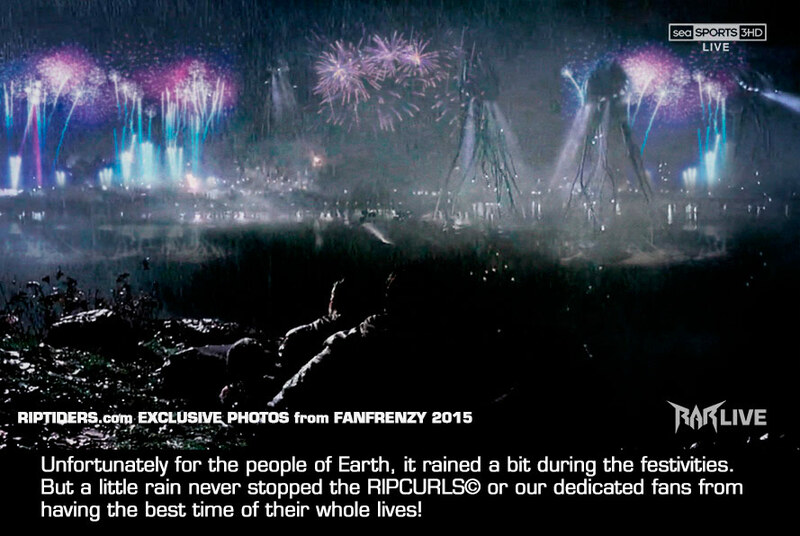 Check out our exclusive photos of FanFrenzy 2015! Hello public! This is the one and only Riptidin' Dreamer, Dirty Rhoades, putting all tha rumors to rest about my untimely demise. Yes, I did slip in the shower, but no, I have not lost the power!! So please ease your minds, cuz the Dirty one is here to stay with you forever! But on the track, things ain't lookin' so hot for on Tsu-Xi! What's gonna happen next? Click and find out! And don't forget to keep submitting your questions to the contact page for a special segment in the future, answering all your fan-queries! And tune in on Friday for the special Vidya Game stream! We're almost at the conclusion of the first Riptiders broadcast on Earth! Who do you think will cross the line? In celebration of the upcoming conclusion of the first race, our sponsors are holding a Q&A with you, the fans! Please submit any and all questions you have about Riptiders© or Race Entertainment© in general over at our Contact section, and your question might make it into our segment! Good luck to our racers, and have fun! Heads up, a new update! Hey fishies, this is ya boy, Fin Venom. Droppin' it like it's hot, it's the latest update from Monday Night Splashdown©. 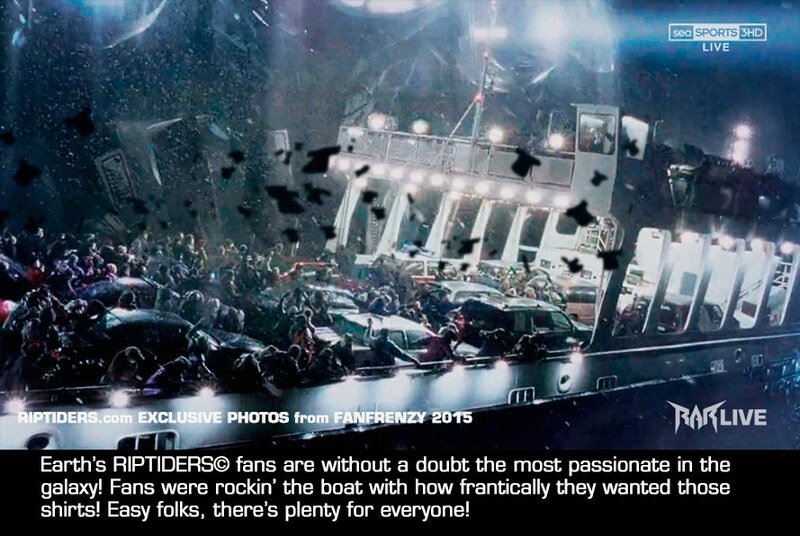 Man, these Riptiders© are going crazy out there, and it's only gonna get hotter from here! "The violence in this latest update has me wondering about whatever health regulations regarding Riptiders. Do said regulations exist? What do they entail? Do they apply to competitors from species with accelerated healing factors? What about on site deaths? Or do you guys have access to cloning and other medical technologies that render such regulations moot?" What are you, dense? This is Riptiders©, bro! Where the big fishies swim! If they can't handle the water, ya gonna get slaughter'ad! If they can heal, no big deal. If they can't hang, too bad, mang! Of course, scrapes, bruises, and other assorted injuries can happen on the track. That's common in any impact sport. The Ripcurls have a top of the line medical facility that can put back together anyone who still has parts to put together. Sponsors can always spend tha cash to revive a Riptider©, but sometimes it's just cheaper to get a new one. I mean, why waste clams on a loser?